Prine's fans are already weighing in with complaints about the great songs omitted from the excellent new live album In Person and On Stage, such as "Sam Stone" and "Hello In There." But among the gems that did make the cut are "Angel From Montgomery," "Your Flag Decal Won't Get You Into Heaven Anymore," "In Spite of Ourselves," "The Late John Garfield Blues," and other fan favorites. 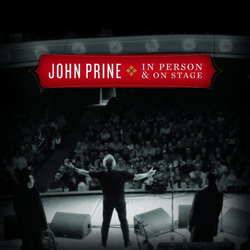 If you're not familiar with John Prine, you should be. And this is as good a place as any to start, because you get not only 14 superb songs but also the banter between them—Prine's not "just" a singer/songwriter; he's a storyteller… and a damned funny one at that. He's also joined by special guests like Emmylou Harris, Iris Dement and Josh Ritter. And if you are familiar with Prine, why add this album to your collection? Same reason—the banter that makes this more than an album; it's a show! "John Garfield" also appears on the Broken Hearts tribute album, as do "Spanish Pipedream" and "Mexican Home." 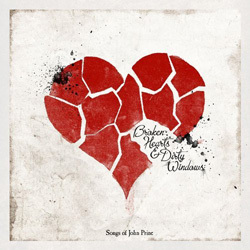 Broken Hearts features 12 cuts, one each by Conor Oberst ("Wedding Day in Funeralville"), My Morning Jacket ("All the Best"), Drive-By Truckers, Deer Tick, and others who are in the enviable position of singing wonderful John Prine songs. All do a pretty fine job of it. Old Crow Medicine Show ("Angel from Montgomery"), Justin Townes Earle ("Far From Me"), and the Avett Brothers ("Spanish Pipedream") prove to be best suited to the task. But they and all the others on the tribute album are in the unenviable position of being compared with the original. John Prine isn't the world's greatest singer. He isn't the world's greatest guitar player. But he may be among the world's greatest songwriters. And he brings a charm and timeless appeal to these songs that few—no matter how hip—can cover.